Here’s a list of must-have Instant Pot accessories that you should own if you want to make the most of your Instant Pot. These accessories will help you bake, steam, make yogurt and do so much more with your Instant Pot. Instant Pot pressure cooker has been a game changer for a lot of folks. It has enabled busy families to eat more often at home by helping them make nutritious food in a convenient and consistent fashion. If you do most of your cooking in your Instant Pot, you should invest in a few accessories that will allow you to make a range of recipes such as this date cake, yogurt, egg bites, and sambar (using pot in pot cooking method). If you are new to pot in pot cooking (also known as PIP), it means to cook two different dishes at the same time, by stacking two utensils. Now there are a ton of Instant Pot accessories in the market, my advice would be to NOT get them all when you buy the Instant Pot. Familiarize yourself with the Instant Pot (check out this Instant Pot guide), make a few basic recipes and once you get a hang of it, go ahead and buy the accessories as needed. The Instant Pot accessories that I am sharing are the ones I own. A few have been sent to me to try out (OXO one) but they have made this list only after I have tried, tested and loved them. Steel Inner Pot – How many Instant Pots do you think you need? I would say two is a good number. Instead of buying more pressure cookers, I would advise buying additional inserts. Keeping an extra steel inner pot allows you to quickly move from making one dish to the other without having to wash dishes. It comes in handy, especially when cooking for a crowd. Sealing ring – Instant Pot recommends replacing sealing rings every 12-18 months. Sealing rings can expand and fail to seal properly with time so it makes sense to have backups. Also, it is a good idea to have separate ones for sweet and savory dishes to prevent the flavors from transferring over. Tempered glass lid – Use it for slow cooking, or when fermenting idli batter in the Instant pot or simply as a lid to cover your Instant Pot when kept in Keep Warm mode. Stackable Containers – These containers allow you to cook two different food items with similar cooking times in one go. For example, you could make rice and dal together, or this sambar recipe where the vegetables are cooked separately from the main curry. It is perfect for pot in pot (PIP) cooking. Cheesecake pan with a removable bottom – Did you know you can make cheesecake in Instant Pot? This 7-inch cheesecake pan is perfect for the job. Bundt Cake Pan – Not just cheesecake, you could bake all kinds of cakes and bread in the Instant Pot. My favorite one to make is this date cake – it comes out perfect every time and this 7-inch Bundt cake pan is all that you need. Egg steamer rack – Instant Pot is known for boiling eggs quickly and in a fashion that the boiled eggs just slide out of the peel. This egg steamer rack is great for boiling eggs and also doubles up as a trivet. In fact, because of its extended height, it does a better job of keeping food above water than the trivet that comes with the Instant Pot making it ideal for pot in pot cooking. Egg Bites – Have you tried making egg bites in Instant Pot? If you decide to, this accessory originally intended for baby food does the job well for you. Oxo Silicone Pressure Cooker Sling – This sling makes it easy to remove bakeware out of a pressure cooker. It is very useful when making this delicious date cake. It also keeps your bakeware above the cooking water. Use it when you are baking cakes, lasagnas, cheesecakes and more. Yogurt strainer – For those who love to make yogurt at home using Instant Pot, this strainer will allow you to separate the whey and get thick Greek-style yogurt. Do you have a favorite Instant Pot accessory that you would like to share with me? Leave a comment and let me know. 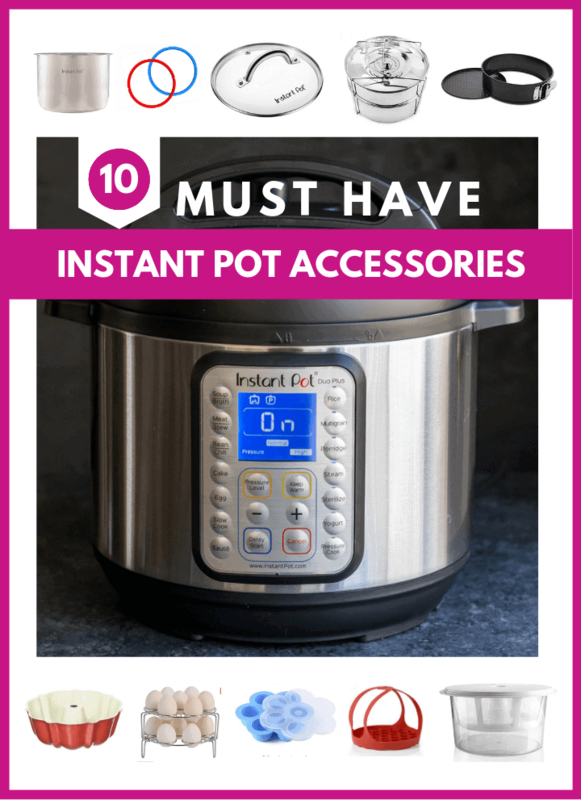 Where to buy Instant Pot Accessories? My place of choice is Amazon. For your handy reference, you can find all these accessories in this link – Must-have Instant Pot Accessories. If you would like to take a peek into my kitchen and look at the essential tools in my kitchen, check out this post.